Mohaather, winner of Newbury’s Horris Hill Stakes last autumn, continued where he had left off on Saturday when returning to the track to capture the Watership Down Stud Greenham Stakes and stamp himself a Classic pretender. 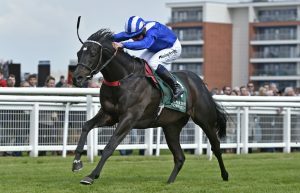 The Hamdan Al Maktoum-owned colt, trained by Marcus Tregoning, put himself forward for a Qipco 2,000 Guineas challenge after quickening to the front over a furlong out to secure the Group 3 prize by three quarters of a length from Great Scot. Mohaather, from the family of Accidental Agent, was cut to 16-1 from 33-1 by Ladbrokes for the Qipco 2,000 Guineas over a furlong further than the Greenham. Tregoning saddled Derby winner Sir Percy to finish second in the race in 2006. Dandhu was cut to 10-1 from 16-1 by Betfair Sportsbook for the Qipco 1,000 Guineas after she edged a three-way photo-finish to the Group 3 Dubai Duty Free Stakes. The first three were separated by short heads as the David Elsworth-trained filly, who was ridden by Gerald Mosse, held off Iconic Choice and So Perfect. In last year’s Rockfel Stakes at Newmarket, Dandhu ran on late to take second behind 1,000 Guineas favourite Just Wonderful and Saturday’s win set up a possible rematch on the Rowley Mile next month. Elsworth said: “I haven’t really given Dandhu a hard preparation. Gerald put her to sleep. He may be French but he and I speak the same language. “Last season when the Rockfel winner had the race in the bag we were finishing strong. Dandhu was only going to improve and we will have to see if we can beat Just Wonderful next time. 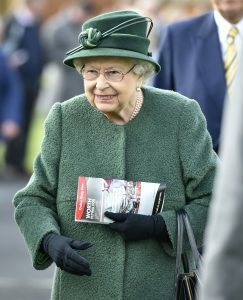 Her Majesty The Queen enjoyed another visit to the Berkshire track where she had three runners across the day. Marmelo had run more times in Australia than he had appeared at his local Newbury racetrack but back from his travels, he reminded everyone how good he is by reeling in Aspetar to claim the Group 3 Dubai Duty Free Finest Surprise Stakes, initiating a double for Mosse. A third tilt at the Melbourne Cup, in which he was runner-up in November, is on the cards but a domestic campaign, possibly including in the Group 1 Investec Coronation Cup, may come first. “It’s fantastic to win at our local track,” said Marmelo’s East Ilsley trainer Hughie Morrison. “He hasn’t been within 200 miles of home for about three years. Peter and Trish Andrews enjoyed their best moment as owners at Newbury when their popular grey Smad Place won the 2015 Hennessy Gold Cup, now Ladbrokes Trophy, to which they added a highlight from the Flat when Chatez took the Mansionbet Spring Cup. Raise You, beaten a nose by King Ottakar last season, paid a handsome compliment to the winner of the conditions stakes 24 hours earlier by landing division two of the Dubai Duty Free Tennis Championships Maiden Stakes by six lengths. 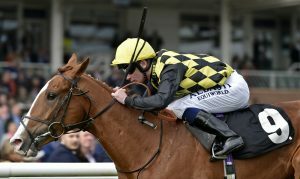 His Kingsclere trainer Andrew Balding secured both divisions with Fox Chairman landing the first leg, giving him three winners over the two days of Dubai Duty Free Spring Trials Weekend. 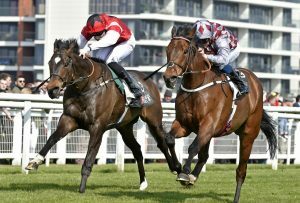 Paul Cole also followed up a Friday success when Majestic Dawn took the Dreweats Maiden Stakes at the expense of the Queen who, paying her annual visit to Newbury, had to settle for second place with the odds-on Pianissimo, the best finish of her three runners on the card. 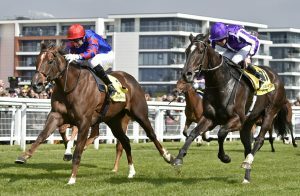 Lunar Jet gained a neck victory in the Dubai Duty Free Millennium Millionaire Handicap 12 months but made light of the stiffer challenge set by running off a 5lb higher mark to win it again for trainer John Mackie by five lengths.